There are many advantages to making rank in the military. Some are obvious: higher pay, more authority, and the pride that comes with seeing oneself pin on new rank insignia. However, there is one particular advantage that many service members don’t realize until it’s too late — the impact that rank could have on one’s job prospects after discharge. The good news is veteran unemployment in general continues to drop, according to the U.S. Bureau of Labor Statistics. The not-so-good news is the record-low annual unemployment rate of 5.1 percent for Post-9/11 veterans in 2016, a drop from 12.1 percent since 2011, does not tell the whole story. 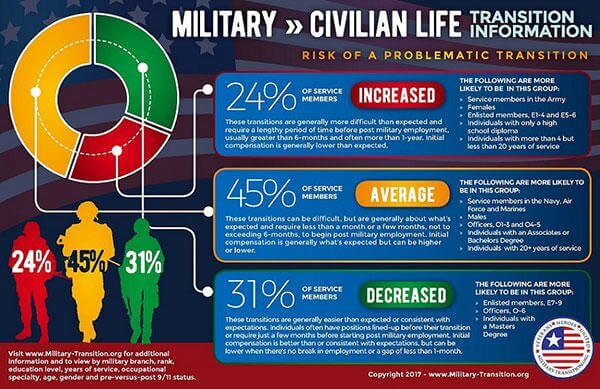 When these statistics are taken from the abstract, what is revealed is what lies behind the “transition stress” that many service members experience even when veteran unemployment is low. Leaving the military can be tough on most service members for myriad reasons. Some of it has to do with facing abrupt changes in culture and identity. But the more practical challenges involve the personal worth one derives from how the job market valuates him or her in terms of employment options, the time it takes to get hired, and the compensation offered. According to research conducted by a team of veterans at Military-Transition.org, nearly a quarter of veterans surveyed found the transition to be harder than expected as they faced longer periods of unemployment and, whenever a job was eventually offered, employers offered far less than expected in salary. Perhaps unsurprisingly, junior enlisted service members who served relatively short tours and only had a high school diploma had the hardest time. Surprisingly, however, many in this group overestimated their value in the job market, which contributes to the depth of the disappointment they experienced once reality had hit them. About 45 percent of transitioning service members who possessed some college, served as commissioned officers, or had 20 years or more of service were more realistic in their expectations and had a relatively easier time finding jobs in which they were generally fairly compensated. The process of taking off the uniform can be a challenge with almost half of veterans surveyed indicating the process was more difficult that they expected. Of note, challenges and difficulties also tend to increase among sub-groups such as Army veterans and females when compared to the entire population of former service members. 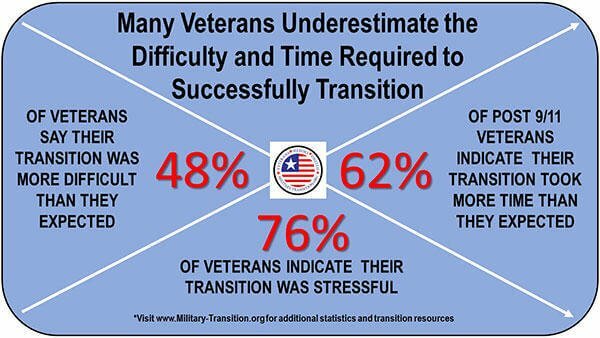 Data for specific veteran sub-groups can be viewed at the following link: https://www.military-transition.org/dashboard.html Another issue of concern is that more than 75% of veterans surveyed indicate their transition was stressful, irrespective of branch of service. Lastly, roughly 60% of post 9/11 veterans surveyed claim to have underestimate the time required to make the transition. Those entering the unfamiliar – these veterans have hard skills that translate directly into the civilian workforce, which makes it easier for them to secure meaningful employment in their areas of expertise. Examples include medical professionals, pilots, specialized technicians, and individuals that return as civil servants in roles that are consistent with previous military duties, and those who begin working as a defense contractor or a similar role with the government. Those entering the somewhat unknown – these veterans have marketable skills, but must learn how to translate these and demonstrate their unique value to a civilian employer. This requires time and effort, and many veterans underestimate the difficulty associated with this process. The majority of veterans fall into this group and the level of unknown is dependent upon their preparation and effort before, during and after the transition. Those entering the complete unknown – these veterans have some marketable skills, but often lack awareness regarding the relevance or value these have to civilian employers. Reasons for this might include lack of education, age or limited life experience, and exaggerated self-worth or expectations of the civilian workforce. This group tends to delay or avoid realistic preparation and is highly if not completely unprepared to undertake the transition into the civilian workforce. The last group, those who face the complete unknown and are least prepared for transition is the highest risk group in terms of chronic unemployment. In addition to being the least competitive in the job market, these service members also face relocation, family, and financial stresses. For those who joined the service at a fairly young age and served relatively short enlistments, many are also living independently for the first time, and may be first-time parents or involved in a relationship that has yet to mature to a point of stability. This is the group that needs the most help and gives Military-Transition.org its animating purpose. Where a military family settles in terms of geography and environment can play a huge role in how well the transition unfolds after leaving the relatively secure confines of base housing or a military-friendly town near a base. Community support, military cultural competency, and proximity to veteran-specific services, such as a VA hospital, DFAS office, and employment opportunities are just a few of the factors that can make a final location good or not-so-good during the transition experience. The team from Military-Transition.org is now focusing on how location impacts veteran transition and employment challenges. To learn more about this, the team has launched a study in which all post 9/11 veterans can participate. The study is anonymous, and veterans are encouraged to share their thoughts at the following link: VETERAN SURVEY *. In addition, military spouses are encouraged to share their employment experiences and challenges at the following link: MILITARY SPOUSE SURVEY *. Thanks to all in advance for your participation.